How Do Male Horses Attract Females? The horse courtship process is a lot more direct than that of human beings. If a stallion has reason to think that he's dealing with a mare "in season," you may observe a lot of conspicuous -- and sometimes rather frustrating -- behavioral patterns in the hormonally influenced equine. When a stallion tries to attract a mare who isn't presently in heat, he may be somewhat tough and physical in his wooing efforts -- often much to the annoyance of the lady horse. Stallions frequently aim to attract mares by repeatedly biting their rear regions, sides or shoulders. They also often smell mares' bodies. Mares often react defensively by screaming, kicking and biting back. This behavior often lasts for days at a time. However, stallions often leave the vicinity when mares keep showing displeasure. And, let's face it, not all mares react particularly defensively to stallion courtship efforts. When mares are in heat, they often signal willingness to breed by engaging in a variety of "displays," namely putting their tails up, urinating and displaying their vulvas. At this point, male horses typically indicate their intentions to breed by pushing their top lips up and smelling the female horses' urine. This action also functions as a way of ensuring a female horse is, indeed, in a suitable condition for mating. At other times, if a stallion is attempting to start the actual mating process, he may express it glaringly via his body language. He may caper up to a mare, all while elevating his tail and slightly curving his neck. This confident body language aims to express mating preparedness. As the horse moves toward the mare, he may even make neighing sounds and thump his legs onto the ground, as well. Apart from basic attempts to attract female horses for mating, male horses also often experience changes in temperament when they are ready to breed -- think intolerance and excessively hyper or antsy behavior. Stallions also are often loud when expressing the desire to mate, producing lots of persistent whinnying sounds, for example. Some owners geld their young male horses in attempts to curb these behaviors. 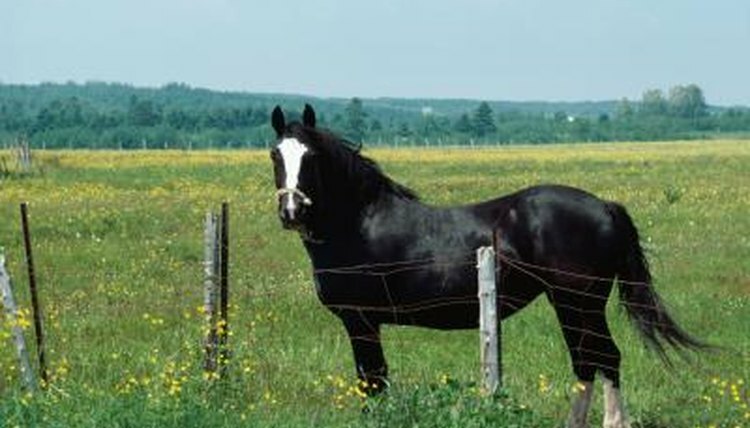 Gelding a horse is a surgical procedure -- similar to neutering a male cat or dog. How Often Do Cows Cycle? Do Horses Stay with Their Mates? What Happens When Bearded Dragons Puff Up? What Age Should You Have Your Horse Gelded? What Factors Cause Crickets to Chirp? Why Do Birds Twitch Their Wings? Is It Bad if My Bearded Dragon Is Getting Darker? Why Would a Horse Neigh Non-Stop?